The people around you can make or break your job search. It's an old saying. But old sayings are around for a reason . . . They make sense. It is true for practically any task or challenge you undertake, and searching for a new job is no exception. In fact, it is an understatement to say that the people around you – and their attitudes about you and your search – will have an effect on your search. It is not overstatement to say that they can make or break your search! So, take a good, lo-n-n-n-n-ng, hard look at the people with whom you surround yourself and ask yourself this question: “Are they helping or hindering my job search? with these folks during your search. How do you tell if someone is helping or hindering? Well, think about it. Don’t you find your energy level drops and your confidence wanes? Interactions with this type person leave you doubting yourself. Your thoughts go to what you can’t do. 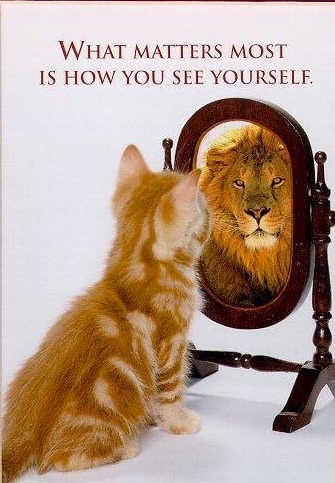 Your self-talk sounds something like: “Who am I kidding? There’s no way I can get a job at _______________ or doing _____________." Don’t you find the opposite occurs? Your energy increases, and so does your confidence. Interactions with this type of person leave you thinking that you may be able to achieve your goal, and your thoughts go to what you can do to achieve it. 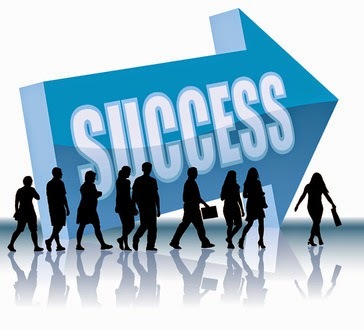 Now, being successful in any of life’s undertakings requires a multitude of things to go your way! No one thing is going to get you there. Hard work, knowledge, technical know-how, strategic planning for and tactical application of your knowledge . . . and a little luck . . . . . are among those things that will get you where you want to go and what you want to achieve. This is true for most things; your job search is no exception. But you can not underestimate the impact of the people who surround you during your search. Their attitude WILL affect you. It will color how you see opportunities and whether you choose to pursue them. It will color how high, or low, you aim . . . . or if you aim at all! It will affect the decisions you make and how you market your capabilities. It will affect the risks you take or don't take. If you are saying "Not me. I'm not all that influenced by what others think," I'd ask you to step back and think about the role of the job or career in our U.S. career-oriented and work-driven culture. We define ourselves by our jobs. For most of us, a great deal of our identity lies in our work. Think about it: When asked to introduce ourselves, we say things like, "I'm an engineer with ABC Company," or "I'm a 20-year veteran of the FBI, and now I work as head of security for . . .." That’s who we are. The people that you surround yourself with can’t achieve success for you. It's a myth to say, "Who you know can get you a job." But, they can greatly influence you and affect you. They can help or hinder you in achieving your goal. This is not to say that these people who are integral to your life don’t have your best interest at heart. It is to say that their interest in you is co-mingled with their own self-interest, and therefore it is hard for them to be completely objective about what truly is best for you. It’s hard for them to see you through an objective lens. Ever heard any of these comments from those around you when you were making a decision? ● If your ( Mom, husband/wife, best friend, aunt, boss, partner, fill in your own blank___________) won’t look out for you, who will? ● Do you think you’re really up for that? ● I don’t know if you have the experience to . . . . .
● Oh, (Alaska, Vegas, Boston, Rome fill in the blank _____________) is so far away. We'll never see you. ● What will I tell my friends? . . . That you're working for a _____________ company. ● It’ll mean we’ll have to take the children out of their school and . . . .
● I'm only trying to help. And so it goes . . . 1,000,001 reasons why you shouldn’t go for the opportunity, take the job, or take a risk. As a Career Transition Expert, coaching 1000s of job seekers over the years, I've heard all of the above comments, and many more. These well intended and important people in our lives are “only trying to help.” But their help often comes with a price; for job seekers, that price can be they won't seek out and go after the opportunity to truly excel, or don’t get the job they really want! Getting advice? Ask yourself WIIFT? Note too, that often, it is hard to argue with or see beyond these well-intended people's advice, because it often makes sense, sounds logical, seems valid. 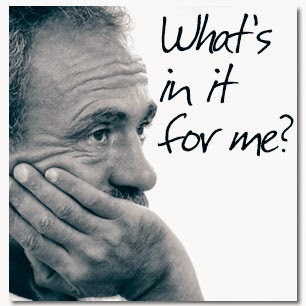 However, the cue and clue, as with any advice someone is giving is to ask yourself “What’s In It for Them - WIIFT?” as well as "What's In It For Me? 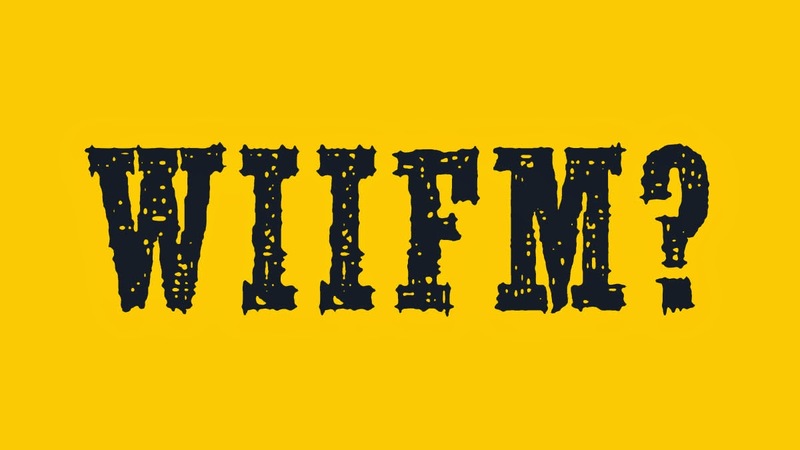 (WIIFM)". ● Be very cautious and intentional about with whom you share your hopes, dreams, goals, plans, strategy, frustrations, disappointments, fears, anxieties, and activity. These should be reserved for one or two of your most trusted friends, colleagues, mentors, or members of your network who you know "have your back." You do need someone to talk with and express your honest feelings, fears, and doubts. But, making your true feelings or displeasure known casually to too many people who "may NOT have your back" can come back to bite you in the form of lost opportunities. I've seen it happen too many times. ● Exert Extreme Caution when it comes to social media. When you post it, it's there . . . forever. Privacy screens have been known to be penetrated, and confidences revealed. Be very careful what you write in e-mails for the same reason. Try the old practice of picking up the phone, or meeting over a coffee, when you have something to say that you don't want written for all to see. ● Don’t presuppose that members of your family, or very close friends, should be part of your inner circle. Remember, these are the folks that have a vested interest in you for their continued well being. It doesn’t mean they can’t see you objectively, but more often than not they don’t. Decide ahead of time "who you will tell what and how much." 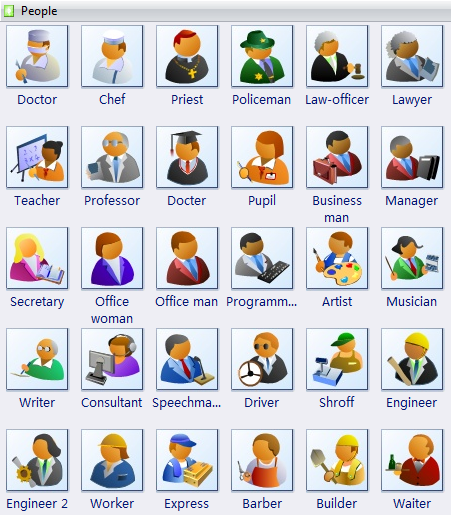 Offer assurances to them that you'll find a job. Keep them informed – at a 20,000 foot level – with your main message being that you are making progress. Skip the detail for the most part. Look to them for sympathy and compassion. But look to your trusted advisers and/or inner circle (can be the same individuals or different people) for empathy, advice, critique, and to serve as your sounding board. ● Join a Job Search Work Team. This is one of the best things you can do to go the distance during your search. The team will keep you motivated to work at your search, especially important when you are feeling discouraged, as well as supplying leads, ideas, and critique. Find a group, or start one of your own, of fellow job seekers with whom you can meet, network, share leads, talk over strategies, and get empathy. They truly walk in your shoes. Keep in mind that this is not a weekly “pity party.” It is a working meeting with your fellow job seekers. ● Keep nurturing and growing your network. You need to get out there to meet new people, and to meet with people who are already part of your network. Sitting at a computer 12 hours a day, filling out applications, is not the quickest or best route to your new job. ● If you have the means, working with a Job Search Coach, i.e., Career Transition Specialist, can provide you with a confidential source to share your information, a sounding board, and real objectivity, as well as current and accurate job search training in how to penetrate the marketplace. It is the job of the coach to tell you what you’re doing right, what you’re doing wrong, and how to maximize the former and improve the latter. Managing your job search is managing a complex project to say the least. A lot of things need to go right for you to find a truly wonderful next opportunity. Managing the people aspects of your search is one of those things that you need to control and do well during your search. The people you choose to surround yourself with can help or hinder you in achieving your goal. Choose wisely because . . . . . Success is truly in the company you keep. "Author's Note. I was traveling south in January of this year and happened to find this beautiful lifestyle magazine displayed in the hotel lobby of a hotel in which I was staying. I opened it to find a Letter from the Publishers, written by co-publisher Brian Hullette, VIP Seen, about achieving success in life, and the importance of the people in your life in achieving it. I found myself re-reading it many times, and it influenced me to write this article. With Mr. Hullette's permission, I have quoted him in this article. Thank you Brian."